Last winter, I had the privilege of being one of the testers for Sherri Lynn Wood's new book, The Handbook for Modern Quilters. I enjoyed my experience immensely. When I received the "Bias Petal" score...a little panic ensued. Why, you might ask? Well, did the improv part unnerve me? No, not in the least, as I have been having my own love affair with improv quilting for some time now. What about the curved piecing or bias strips?? No, not really, curved piecing and I are old friends. What was it then?? The word PETAL...yes, the word PETAL!! Nothing personal...but, but, but I don't do flowery petal type things!!!! Yup....that knocked me right out of my comfort zone, which is probably a good thing. I needed several bias strips and as usual got a little carried away. I cut meters upon meters of bias strips (after all, I wanted variety). I still have plenty of those strips sitting around for more projects. Whenever working with fabric cut on the bias....bubbles and puckers can be a problem. But Sherry Lynn has plenty of tips to combat those pesky bubbles. My secret weapon is spray starch!!!! I made several petals...and just kept putting up on my black design wall. I used several gradient type fabrics and mostly solids or tone on tone fabrics. I decided to shatter the petals...somewhere along the way, I stopped thinking of them as petals. I shattered them by slicing through the petals (using my rotary cutter) and shifting them a little and sewing them back together. The shattering and shifting....created a fairly different effect. I took one look at the design wall and the question that kept running through my head was....how in the world am I going to put this all together, into one piece??? I was determined to do it all by machine....no hand sewing whatsoever. As you can see, I started by quilting sections, with no idea where I was going. And of course, I tossed in a little QAYG (Quilt as you Go) for good measure. As an added bonus, I had the pleasure of taking a workshop with Sherry Lynn (Quilt Con 2015). The score here was "Floating Squares", but that would be another blog post. My major problem here was limiting myself to so few fabrics....it wasn't long before I was sneaking in a few more in. Hey, that is what improv is all about, right? Sherri Lynn's publishers are generously giving away one free copy of Sherri Lynn's fabulous book. Just leave me a comment about your experience or lack of experience regarding improv type quilting by July 15. I would love to hear your thoughts. Note: the book give away is open for residents of Canada and the United States only. Also, please make sure your email info is available, with your comment should you be a no-reply commenter. I think this book is something for me - I so much like the modern aspect - and you did a wonderful job! I love you design and everything you do. 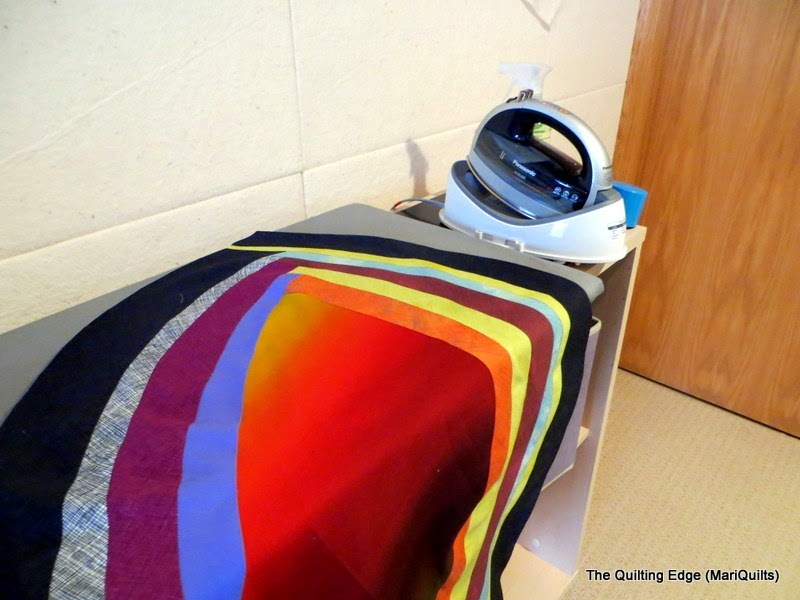 QAYG has changed the way I quilt. I'd love a chance at the book too!! I don't have a lot of experience with improv but love the results so I'd like to try. I took the plunge to QAYG after reading one of your posts, so perhaps this book would encourage me to improvise! I would. Love to do a QAYG quilt. I am planning on it. Wow! My only experience is with a QAYG quilt currently in progress, but would love to win this book! Improv - i am not sure I have that much imagination. I think in strong repeated patterns that are more traditional. I already own her book and love it - seeing your interpretation of petals, and following your process here is a perfect complement to the book! I just love your use of graduated fabrics and the shatter -- genius! Thank you for sharing this and thanks to SL for connecting her readers with your experience. I love the idea of incorporating curves in improv and doing it all by machine. I need to try this. Improv piecing is pretty much all I do anymore. I submitted some pieces, but none of mine were chosen. I think my work was too tame. Your piece turned out fantastic! So cool! I love the mix between the ombre and the solids, Marianne. It adds such great movement. Gorgeous! Thanks for the giveaway! I have some experience with improv piecing, but my way is just grab pieces and sew them together (doesn't matter if they are not the same size=sew then trim) Then I cut them into blocks. 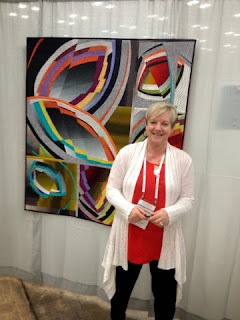 Sherri Lynn's frameworks would certainly add a new dimension to my improv quilting. Had the opportunity to see your great quilt at QuiltCon. Thanks for the great giveaway...I would love to win a copy of the book. I have tried improv a few times, but would love to attempt it with "scores." I have not tried improv as of yet but it is something I would like to try at some point. Thanks for opportunity to win. I follow via 2bquilting247 at hotmail.ca. I would love to have the book. Your blog inspired my first but I would love to feel going and try more. Thanks for the opportunity! Improv piecing is fairly new to me but with practice I am getting the hang of it. I'm really looking forward to doing more of this. My sole improv so far is a small 12" quilt made for a challenge. I found it so freeing - I loved it! Your quilt is beautiful, such a wonderful interpretation of the score. I have Sherry Lynn's wonderful book, so please skip me for the giveaway. I have had no experience making an improv quilt but I admire the bravery and would like to try! I love modern quilts. I love doing improv and yours is a real beauty. I really enjoy improv, though I've never been brave enough to just cut something up that I've worked hard on to see what it looks like. I love this fractured look so maybe I should go for it! Wonderful to see your process. I do use improv. Am working on my QAYG methods as that's the only way I'm ever going to get larger pieces quilted. Thanks again for sharing. 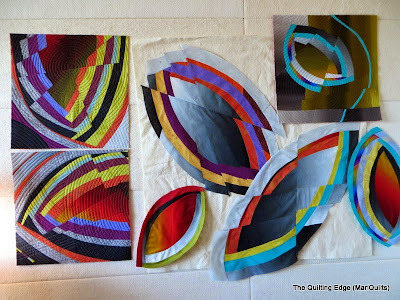 Love the bold colors of your quilt & piecing techniques. I've been experimenting with curved piecing. Hi Marianne, ever since you taught us the course I am hooked on QAYG. Would love to win the book. Enjoy our wonderful summer! I would love to try this. Your quilt is beautiful. Thanks for the chance to win. All my friends laugh at me when I say I want to do improv - it is my type A personality - everything must be perfect and precise...whidh is why I want to dive into the improv pool, I need to break free....it sounds like this book is exactly what I need to et started - I so enjoy your work. Your work and Sherry's message resonate with me: The colors, the imperfection.... Life! I have sewn and improvised clothing, but have just joined a quilting guild and an art quilting guild (SAQA) and signed up for a workshop by Rayna Gillman. I am ready to quilt and I would love to win that book. I love Rayna's work....it should be a fabulous workshop. I am so ready to try my hand at improv! Love your work! I love your blog and have been following for some time. I have been inspired by some of your work and have used it as a starting point for a few projects. To answer your question: What I enjoy about improv is the ability to begin with an idea and see where that idea leads. The process is fun and very rewarding when I end up with something new and fresh. Thanks for the great opportunity to win the book. I love the sweeping lines of your quilt. It would work even done entirely in gray scale. With the color though, and the quilting, it truly is a piece of art. Very inspiring. Thanks for your blog+giveaway! Just starting to appreciate Improv Quilting! Would love to know more! Happy Summer! Your petals turned out amazing! I enjoyed test quilting the floating squares for Sherri after I lost my own sense of panic. :) Would love to win the book and learn more about improv. Working on my second improv quilt now. So much fun, and a nice change from following a formal pattern. Love working with improv and have been watching all the goodies appear from Sherri's book. Would love a copy to play with! I am an improv fan and love throwing rulers and precision out the window! So cool - I heard your voice as I read this! Love the quilt Marianne. You make such excellent work. And I would love to see the book to see which bias petal quilt chosen for publication. Happy Canada day! I've done only a little improv quilting. It's hard to shake the ruler habit! But I love the look of freehand cutting, so I'm eager to get some guidance from this book. As always your creativity blows me away! After being in our new-to-us home for almost 2 years, the quilt room is done and I'm ready to finally unpack my sewing machine. Looking forward to finding the freedom of improvisation and eager to get my creativity on! Would using your QAYG method be considered improv?? HE HE Because my quilting is strictly Art Quilting, all my work is improv for sure! Can't wait to see this book!!!! I took my first class in what is now called Improv quilting (I called it 'jazz piecing' back then:) in 1991. We could use a straight edge with a rotary cutter (but not measure) or scissors by hand to cut the fabrics .. I made an improv beach scene that I still love quite a bit. I truly enjoy improv piecing ... and have been considering doing curves like your 'petals' for a while now. I've been looking for a push to try improv quilting. I now have the time, the motivation and plenty of fabric. Thanks for a chance! I haven't tried improv quilting yet but have to admit I love the sense of freedom I think it would allow. I'm not sure how to start and sure could use all the help I can. Thanks for the chance. I just can't seem to follow patterns so like you feel most comfortable doing my own thing. I absolutely love how your mind works. It's always a surprise to see what you come up with. I was a test quilter for the floating squares score. I will have to admit, NO RULER was difficult for me. I saw your quilt at QuiltCon and it is stunning! You taught our workshop in Whistler last fall. Improv curves and quilt as you go. The fact we didn't need pins and you said there are no quilt police was an eye opener. Loved the class. Improv is something that I want to try and have enjoyed getting all the tidbits and eye candy from your blog. I think that I am getting the nerve to try it. I took a class on improv baskets and really enjoyed it. I would love to try the petals. Your quilt is stunning. THank you for the giveaway! Love what youmake. I don't do much of improv because the lack of structure or regulations scares me. Probably too Japanese. Getting a bit more brave though. I've only just gotten my tippy toes wet in improv quilt-making. I used it as a background for applique. I think if I played more with fabric (before cutting) it might inspire me more, and free me from thinking too much! Your contribution to this book looks amazing and the book is on my wish list at Amazon. It would be great to be able to have this book more of the technique of improv quilting. Your quilts are so inspiring! I love the freedom of improv quilting, and how each person's approach to the same theme will yield such wildly varying results. Your fabric selections and creativity always inspire me! I love the Improv projects I see online and hope to tackle a project soon. Your quilts and process have always impressed me and YES, I do use improv piecing when I get started on all of my new quilts. Inspired by the playful way that new designs emerge, I love the spontaneity and fun of the surprises that happen This new book will undoubtedly be more inspiration and I would be happy to add it to our Textile Design Program Library at St. Lawrence College. Thanks for sharing and I will always be watching for new ideas and you have soooo many! Me encantaría tener ese libro!!!! amo los quilts contemporaneos!!! I would love that book !!!! I love the contemporary quilts !!! I so want to try improv quilting but I feel intimidated by the process. You make it look so carefree and easy to do. I am sure this book will nudge me in the right direction. Re Improv quilting: I have heard lectures, read blogs, watched tutorials and admired the improv work of others. I have bought a sewing machine foot that practically guarantees perfect curved piecing. I have stacked the fabric I would use for improv (borrowing from your love of gradiated and shot cotton fabrics) . I have done everything but actually DO it. Why? Because I'm chicken! I'm afraid I will ruin some perfectly lovely fabric. I have learned through this "mental block" that I feel the need to control my sewing and quilting, and this need for control is the poison of creativity. Maybe this book (and your wonderfut tutes) will be the key to unlocking me and freeing me to take the plunge. Your SHIFTING IMPRESSIONS is fabulous. I've learned QAYG from your tutorial and now am about to embark on an eco-dyed silk quilt. Talk about Improv!? This book sounds exciting. I have been very afraid of trying improv quilting or QAYG. You make it look easy and I would love to win this book as a little kickstart to trying it myself! I have no experience in improv quilting but I really need to try it. I love your design. In fact I love all your designs. I love modern quilting! Thank you for the give away. This book looks like something right up my alley! Looks terrific! Life is so much easier using gradient fabrics isn't it? I was dyeing my own and it is sooo much work. I think your process would be much more enjoyable and easier too! Well, I live and learn! Thanks for the post. What an interesting blog post ~ ~ you sold me on Improv and QAYG a couple of years ago and I have been having so much fun. I tried an Improv with curves project a few months ago and love the finished product but the process was a serious brain stretch. Now I want to try yours and Sherry's approach. This might work better for me. The book would be a great win ~ ~ but I'm glad to buy it too. Your quilt is so impressive. I think you have set a new benchmark for Improv Quilting! Thanks for the giveaway. I have tried improv a few times and ended up with some individual blocks, would love to take a class to really get some hands on instruction on it as I'm just playing around and have only finished one project. Love your curvy quilt! I'm new to this but oh so fascinated by it all. Love the fractured petals!! I have tried improv but still have a problem with letting go. I did enjoy what I did but find I need more guidance and inspiration. I like Improv when I'm stuck on a project and need to more forward as it makes me "not think" and have fun! I've done a little improv - or liberated - piecing, mainly when learning from Gwen Marston. But I'm not terribly good at breaking free from using a pattern and letting go; even though I really love improv and want to do it! I love your quilt and your decidedly "un-girly" petals! Love the concept and love your quilt! It's great to see you posting again! Haven't tried improv quilting, but, your quilt is beautiful--might have to give it a try! I've never been great at bias sewing. I love curves and really liked that you fractured the " petals ". Would love to win the book! You've done it again! What a great piece. I have done a few small projects with improve. I like it and would like to do a larger piece. Thanks for the chance to win a copy of this book. My only improv attempt is still a UFO I love the quilt you made and I pinned it for inspiration. I love curves but haven't done much improv. This book sounds like a great one to get me started. You've done it again-spectacular quilt! Welcome back! I've done a couple of improve pieces with Jean Wells and need to get back to the quilt that I planned in one of her classes man years ago. I've got the fabric and the techniques. Just need to start. I've done quite a bit of improve quilting, but never with bias strips and after seeing yours I want to give it a try! Saw the book at my local bookstore. I was entranced by improv quilting. Hope to learn how. the shifting gives is such a marvelous look. Been following you for a long time silently. I have always been an improv quilter since I learned that I cannot follow instructions. I agree that bias strips work very well for curved piecing. I would love to have the book and see what new thing I can try. I have not tried improv quilting. Looks like tons of fun. I've done a bit of improv piecing, and was also a tester for one of the scores and I am very happy with the finished quilt. I love the way you fractured the petals!! The petal shape is the shape in the book that intrigues me the most! One of these days, I will find the courage to tackle it. I'm always so impressed with those who do improv so effortlessly! I struggle with it, I must admit! Thanks for sharing your experience and this great giveaway. I absolutely LOVE your fractured version of the score and was thrilled to see it in person at QuiltCon. Being a test quilter was a lot of fun and definitely a learning experience. Haven't done improv quilting yet, but looks like it would be really fun. Love your Petals quilt! Your petals are gorgeous! I am a big old scaredy cat and have never tried improv quilting. I'd love to try this book's approach. Thanks for offering the giveaway. Improv quilting impresses me, and your work looks amazing! Sherry Lynn's fabulous book is something I need! It's all improv for me and when I do large quilts now, it's a QAYG! Your stuff is AMAZING! I'm always inspired by what you do! Like Janis, oretty much everything I do is improv from design to finish! Which is the way I like it. But I have yet to try QAYG, believe it or not. When I am ready to take this on, I aill definitely be using your tutorials because I am such a fan of your style! I was originally drawn to quilting because I adored the crazy quilts of long ago, made from velvet and left-over dress fabrics. And yet, I've never made a crazy quilt, which is akin to Improv quilts. Maybe it's high time to learn! I'm not very good at improv. I would love to have the book. I connected with improv quilting first. I have not quilted a "true" quilt yet!. The two quilts I've sewn were both improv! Would love the opportunity to win the book - thank you! Improv is my favorite of all quilting! I would love to win. Your petals are astounding! I've tried a bit, but nothing as adventuresome as your petals. Terrific! I've been QAYG gal for quite sometime and your blog really showed me the various ways one can do art and quilt as you go. This book looks very inviting to me and would love to win it, thanks for hosting a review for us. I love improv quilting. I always think it is going to be the quicker, easier choice, and end up laughing at myself because inevitably it turns out to take much longer and be harder--but always more fun, more satisfying, and more challenging all the way through. I just love it. I seriously love your quilt. My very first quilt around 4 years ago was QAYG and I haven't done another. I want to though. I have become completely addicted to making quilts ever since. ( i've made over 40) . I hate following patterns and just make up as I go. I love improv but haven't done as much as I would like because I find it hard making blocks fit together. I think Sherri's book is exactly what I need and would help with that. I have a couple of books but hers intrigues me especially her improv curves. I have just started sewing curves this year. My family think I'm a little crazy (obsessed ) about quilting. ;-) I love your blog. 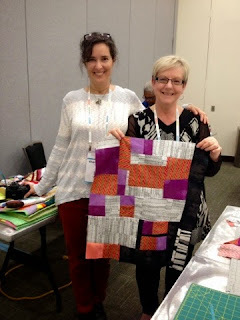 Wow, your quilt journey is awesome! That looks like such an intense method broken down to something I might be able to! Congratulations on such a beauty! My family things I am obsessed too!?,. I would love the book, as I love improv quilts, but I'm a little chicken. What would be even better are several days in your studio with you! You can reach me at nancyklatt 8 at gmail dot com. Thank you for being so generous with your tutorials. Your fractured petals are beautiful. I will have to try that technique. It look like it has wonderful prompts and there's nothing like a good prompt....except maybe for a good limit. If my improve would turn out half as great as yours I wouldn't be so scared of it!! Hopefully one day..... but I will keep dreaming! I love to take the bits and pieces left over from other projects and just improvise with them, it's a good way to recharge my creative side. I have never tried improv quilting but I recently joined a modern quilt guild. I look forward to it! I lack improv experience. The book sounds amazing and the quilts are beautiful. I have been wanting to try improv quilting for a while. This book would be an awesome way to get started. Thanks for the opportunity. As a fairly new quilter my "style" is still evolving. I am also a type A so departing from a very precise design is challenging; however, I never thought I could do scrappy but I can & love it! I will try improv quilting at some point. I certainly admire the improv designs & quilts of others such as you! Your web site is full of eye candy & your improv petals is no exception. Than you for all the inspiration, tutorials, & sharing. Would love to win this book as I do not have any improv books in my library. I must remedy this situation :) Thank you for the opportunity. Haha, "Petals" is the part of that score that worried me the most too. I'm a big fan of improv, and I think it helps that as a new quilter, one of my first few classes was with Sheri Lynn Wood. Thanks for sharing more about your process here! It's so interesting to hear how other people work their quilts out. I do tend to fall more on the "improv with a plan" side - I like to have an idea where I'm going, then improvise to get there. Your process is more improvising the whole time, and you end up with really dynamic results! Your original post on this quilt is what made me buy the book. Improv is really the only quilting I like so I was thrilled to learn some new techniques. I'm still working towards curves but I love the freedom to play. I really enjoy improv and the process part of making the quilt. The finishing part...not so much! Something to work on! Love your shattered petals. Thanks for your giveaway! I love improv quilting and am always interested in the thought process of different quilters.